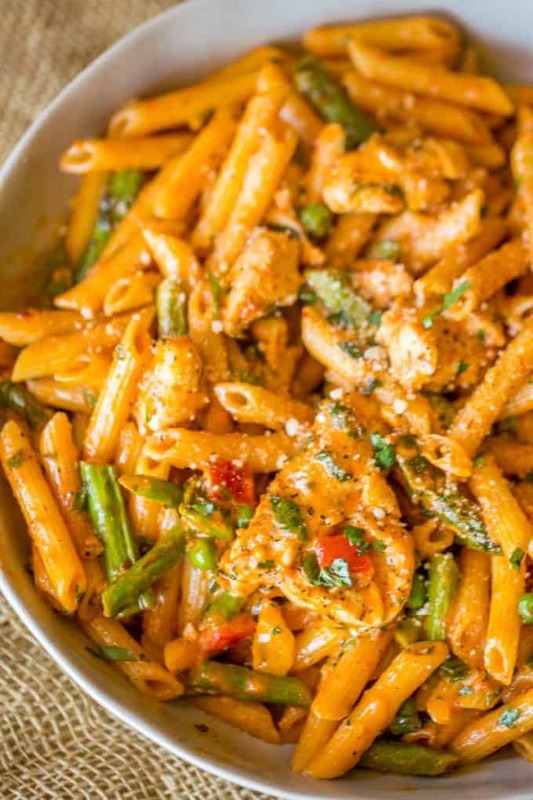 Spicy Chicken Chipotle Pasta from The Cheesecake Factory with asparagus, bell peppers and peas with honey glazed chicken in a spicy chipotle parmesan cream sauce. She described this dish to me and I was totally confused. What do asparagus and peas have to do with spicy honey glazed chicken and chipotle parmesan cream sauce? Leap of faith totally paid off. I can’t explain the combination but I can tell you it is totally delicious. The sauce is a creamy mix of Parmesan and spicy adobo which is tempered by a pretty hearty serving of heavy cream. The just barely cooked asparagus and green peas make the dish still feel fresh and the just barely noticeable honey component takes the edge off those chili peppers. It works well people, really really well. Looking for more Cheesecake Factory Recipes? Adobo Peppers in Sauce: I use just the sauce, if you want to kick up the heat even more use just one pepper instead and mash it into a paste before adding it to the sauce. 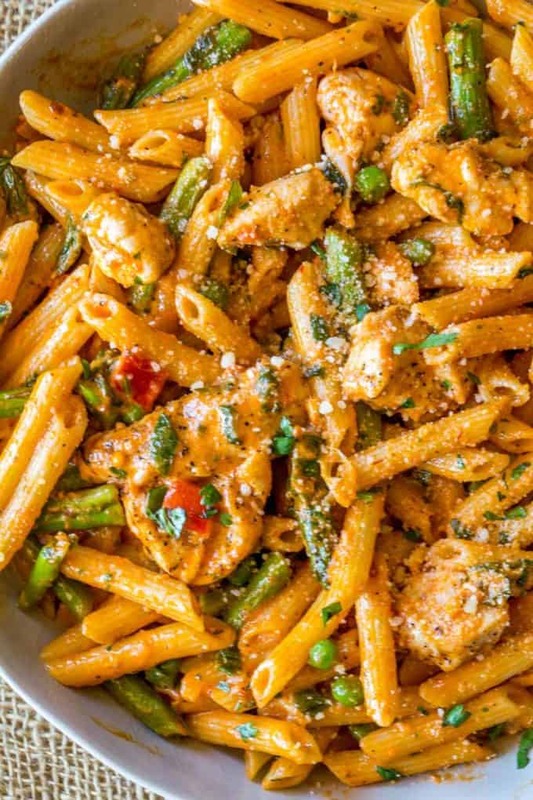 Cheesecake Factory Spicy Chicken Chipotle Pasta with asparagus, bell peppers and peas with honey glazed chicken in a spicy chipotle parmesan cream sauce. Set your water to boil for your pasta. Add the asparagus to the pasta water and boil for 2-3 minutes or until tender crisp. Shock it with cold water through a colander. Add the pasta to a minute shy of the directions and drain into the same bowl as the asparagus but don’t rinse. In a bowl with your chicken add the lemon juice, salt and pepper and let sit as you cook the rest of the dish. In a large skillet add the butter and melt over medium heat. Add the bell peppers and onions and cook until just translucent. Add in the garlic and cook an extra minute. Remove the vegetables and add in the olive oil. Add the chicken to the pan and turn the heat up to medum-high. Add in the honey and stir, cooking an additional 5 seconds. Stir well, then add in the adobo sauce, heavy cream and Parmesan cheese. Cook for 3-4 minutes then add in the pasta, asparagus and frozen green peas. 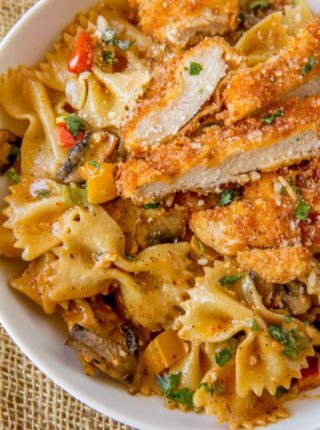 Stir to coat everything and serve with any garnishes you’d like (Cheesecake Factory uses tortilla strip chips and cilantro). 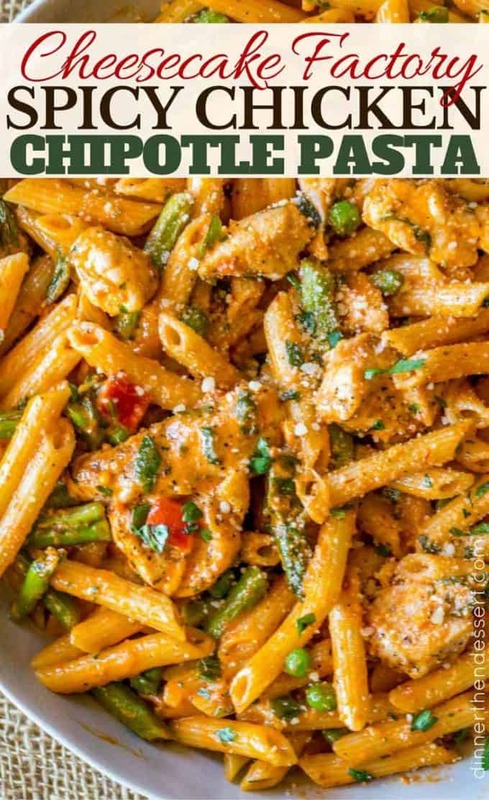 I made the Spicy Chicken Chipotle Pasta this evening using this recipe as a guide. It turned out way better than Cheesecake Factory’s. I was kind of disappointed last time we went there because we paid $66.00 for two Chipotle Pasta dishes and a salad and our pasta was extremely dry. Barely any sauce. This definitely made up for that. I’m so glad you decided to give it a try at home and enjoyed it. Much more budget friendly too! This recipe is SPOT ON. My boyfriend and I have made it several times and each time we’ve tweaked the recipe slightly to our liking, but following the instructions will give you exactly that Cheesecake Factory taste. 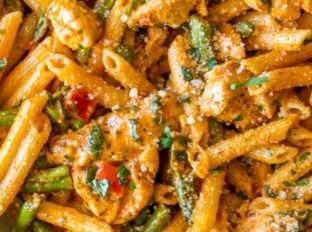 We make this recipe gluten free by replacing the pasta with rice and we also started adding a little more adobo/chipotle peppers for more spice. We also found amazing gluten free tortilla strips by Fresh Gourmet to garnish. Highly recommend this recipe!!! Thanks so much, Cori! I’m glad you were able to adjust it to make it GF. I made this tonight with no substitutions and it tasted great, but I too wonder why mine came out white instead of red. You could taste the kick in it so there was enough of the adabo sauce. I even used less than 2 cups of heavy cream (only had 1 3/4 cup) so I’m stumped. Would have liked the red color, but my toughest critic (my teenage brother) went for seconds so that’s a win in my book. Thanks! Just made this for dinner. It’s wonderful! Thanks so much and keep up the good cooking! Thank you for this delicious recipe! I made this today and I’m so happy I have leftovers to take to work for lunch tomorrow! I didn’t have double cream so I substituted it for evaporated milk, which I already had in the pantry. I also blended some chipotle peppers along with the abodo and evaporated milk and then followed the rest of the steps. Yummy! I was shocked by how similar this recipe tasted compared to the cheesecake dish! Amazing!! Thank you so much for this recipe. 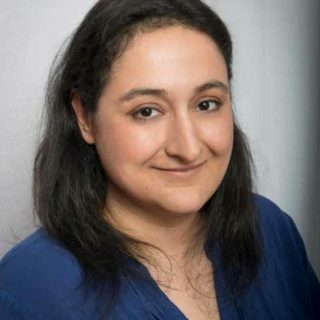 Thank you so much for the 5 stars, Nina! I really pride myself on being as accurate as I can when it comes to copycat recipes. Made 1/2 of the recipe with no changes and it turned out perfect. Will start making this a regular. Love that it is both sweet and spicy. Thanks for the 5 stars, Ron! So glad you loved it! Made this last night and OMG!!! I am officially addicted to this site! Making the philly cheesesteak shells tonight!! Yummy!!! Haha, love it!! Glad you’re enjoying the recipes! Where can I get the chipotle pepper sauce from canned adobo peppers?Any Brand or the way I can make it? Is it possible for me to use heavy whipping cream for this recipe? What’s the difference? Yes, you can use it. Heavy cream has a bit more fat than whipping cream but essentially it’s the same. Do you only add the sauce from the chipotle pepper sauce not any of the actual peppers? Delicious! I’m now living in Brazil and miss the Cheesecake Factory. I had to sub green beans for asparagus, and homemade salsa for chipotle pepper sauce, but it still was wonderful! Simply delicious. My wife and I love Cheese Cake Factory, unfortunately there is not one in our neck of the woods. But, whenever we travel abroad we imediatly float to this restaurant for this specific plate. I cannot tell you how long its been since we had the pleasure of eating this dish. So, getting down to this recipe. Delightful. I cannot make a true comparison because its been that long but to the best of my memory it’s spot on. I am no cook by no means so whatever time it takes you, it took me double or more. The simplicity of your recipe was a pleasure to follow. My wife and I will be making this dish again and again, hopefully with more skill and expedience. Thank you so much for bringing a bit of culinary heaven to our home. I’m so glad you’re able to enjoy it now whenever you want! Very tasty, but the one thing I was not a fan of was how watery the sauce was. It was not as thick as I had hoped…and I even added more parm. cheese! I am sure it thickens leftover, but wish it was thicket to start. I’m so glad you enjoyed the taste! Next time you try it, make sure rinse the frozen peas and pat dry before adding. Also, don’t rinse the pasta and it helps to thicken as well. Sometimes it could just mean it might need to cook down longer. Good luck! 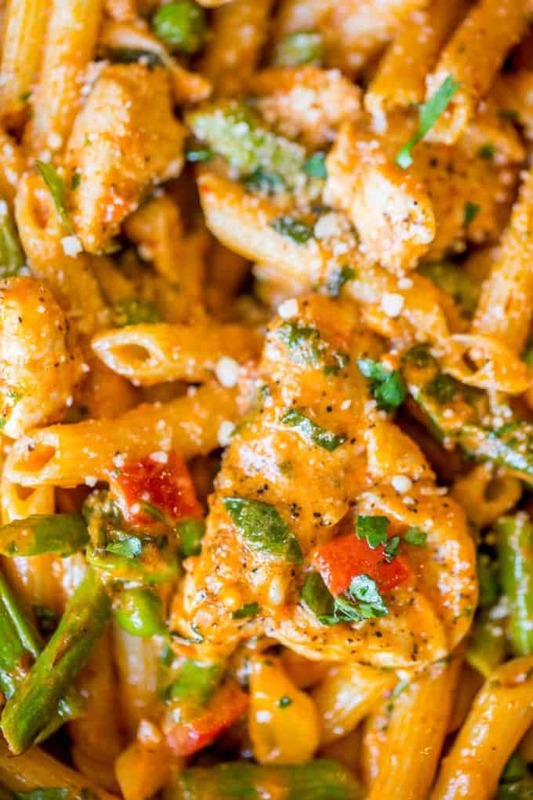 I have moved to England and dream about this pasta since leaving the US! I made it last night and it was spot on. Thank you so much! Yay!! Thanks for coming back to let me know! Thank you very much, this will be in my recipe collection. That’s awesome! I love hearing the whole family enjoyed it!! So delicious! This is my favorite dish at cheesecake! Only thing I wish I had were those tortilla chips for the crunch!! The next day the leftovers tasted even better. I forgot the cliantro will def use it next time for the garnish. 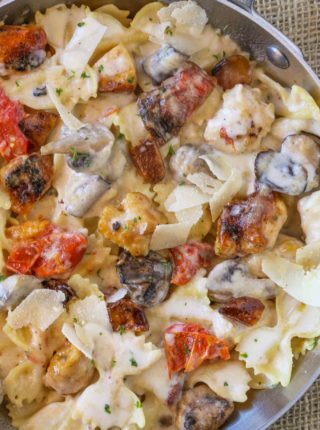 Had this at cheesecake factory the other night, best pasta i’ve ever had, need need NEED it again, thanks for the recipe! Making it tonight! Made this today and LOVE IT. I halved the recipe and reduced the spicy, as my husband doesn’t like things too spicy. 🙂 Thank youuuuuuuu! Yay, so happy to see that you both loved it! Thanks for taking the time to come back and let me know. Is there a substitute for the chipotle pepper sauce from canned adobo peppers? 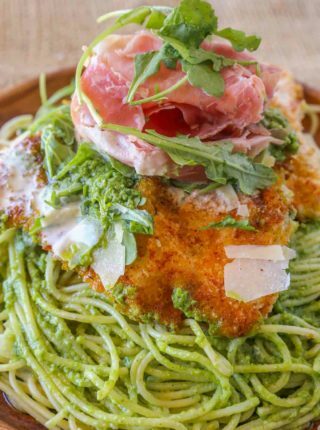 Havent made this yet but it looks delicious. I would suggest mixing 1 tablespoon tomato paste, 1 tablespoon cider vinegar, 1 teaspoon chipotle powder, 1/2 teaspoon cumin, a pinch of oregano, a pinch of garlic powder, and a pinch of salt. You may need to adjust the amounts to your liking but this will at least give you a starting point. Enjoy! I have a slightly dumb question. When you say boil the asparagus then shock, you mean fish it out of the boiled water not dump the whole pot? Then you would have to restart your water. Sorry for confusion. Sorry for the confusion. I used the same pot and water to boil both the asparagus and pasta. It saves having to dirty another pot and boiling more water. So yes, boil the asparagus and take it out of the water then pour your pasta in that same water. Hope this helps! Enjoy!! I know what will be my dinner tonight! The best combo! Ooo! This looks so good! And It has the combo of my two favorite additions to pasta: asparagus and peas! Nice! Gotta add those veggies in where you can! 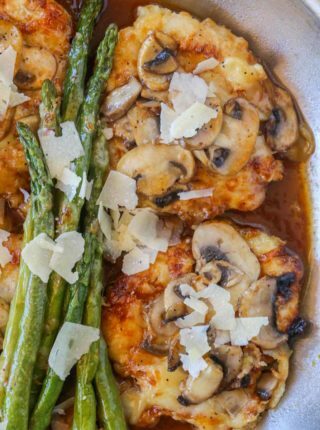 This is definitely my kind of dinner, and I love that it’s so easy! Oh my this looks dreamy! I need to make this asap! I seriously wish I was having this for dinner tonight. I love anything chipotle! This looks perfect! Looks just like the original! YUM!